I am really pained by this news. It seemed tragic as I narrate this. 'Tragic' not in the sense of' Death' but 'Tragic' in the sense of 'Theft'. I went to bed pretty early the night before at about past 8pm. Few hours into my sleep, my phone rang. I picked up without looking at the caller but suddenly found out that it was my younger sister. She told me that my immediate younger brother had been attacked, his car and has had been stolen at gun point. The details were sketchy and so I decided to visit them at the divisional Police Station at Garki Village where they were. My younger brother decided to sell his Honda Baby Boy 1999 Model and then told his mechanic about his intentions. His mechanic linked him up with a potential buyer who indicated interest. Upon several deliberations, they agreed and the buyer finally decided to pay and pick the car yesterday, Monday 1st August, 2016. They eventually met at the house somewhere at Wuse 2 at about past 8pm. 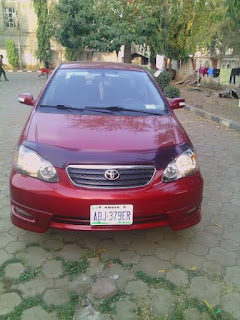 The buyer came with a friend of his and they did a test-drive of the car and subsequently paid the sum of N350, 000.00. Because it was late, they agreed on signing the Agreement Papers the following day. Before now, my brother had a Book Launch where he was promised several sums of money and on this day, a lady promised to redeem her promise by requesting that my brother Visit her. Believing that the duo had gone, my brother decided to visit the lady thereby requesting that my younger sister gives him her car key so he could take the sum he had received from the buyers and drop in his Office to enable him deposit same at the Bank the penultimate day. He drove to FCDA Quarter's opposite Rita Lori Hotel, Garki 2 and summoned the lady who came to meet him in the car with her offering. Suddenly, out of the blues, Four Vagabonds approached the car, dragged them to the back seat, stuffed under the seat and drove then to an unknown destination. My brother was eventually let off their hook after he had been manhandled. He was thrown outta the car somewhere around Orozo enroute Nassarawa State whilst they made away with the girl, the two cars, monies, phones and other valuables. On reaching the Police Station, the IPO narrated a similar scenario that transpired a forth night ago at the same spot. A woman who went to visit her friend at the same quarters, was taken away in her Mercedes Benz ML and driven away to a distance, until she was left off the hook and given N500.00 to find her way. Apparently, her Benz had a tracking device which tracked the location of her vehicle to somewhere in Niger Republic. Albeit, the car has not been recovered and the syndicate yet to be arrested. In similar vein, the lady that was taken alongside my brother, was also dropped and given money to find her way. Before she was let go, some nonentity kept instructing the miscreants not to harm her which further suggest that there might have been an insider in the whole saga. Below is attachment of the vehicles: A red 2005 model Corrolla Sports, full option and an Army Green Honda Baby Boy 1999 model. 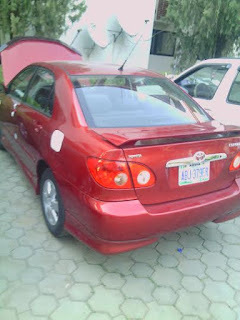 Any one with useful Information should please contact: Morris-08065709630 and Jarius-07032644922.